It’s durian season again. 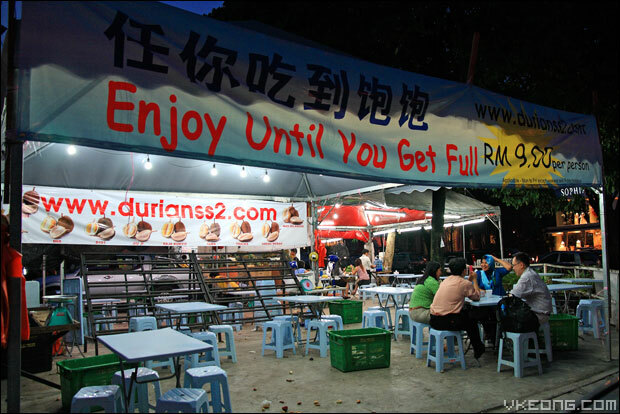 And since I have never been to any durian buffet (or better known as eat all you can durian here in KL) I decided to have give it a try at one of the many stalls located at SS2. So far I haven’t seen this eat all you can durian thingy in Penang before, maybe that’s because Penang is selling it at RM1 each lol. 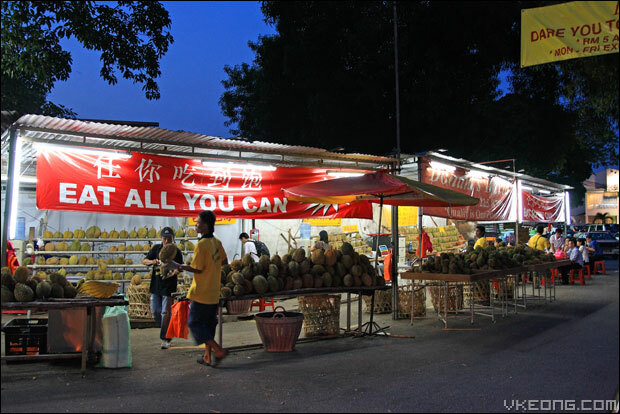 Located a stone throw’s away from SS2’s police station near the rows of bridal shops are three durian stalls having their very own durian buffets. 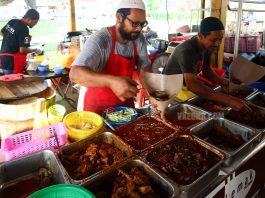 For RM10 you can MAKAN SAMPAI KENYANG. Before you get all excited about feasting on Hor Lor and Ang Heh (Red Prawn), keep in mind that only Durian Kampung is served for the buffet at this price. 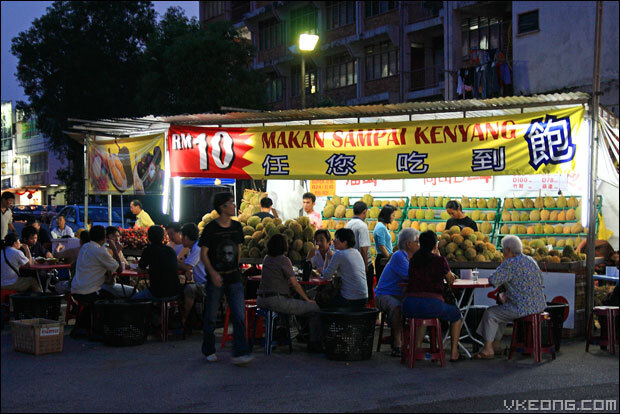 DurianSS2 offers the cheapest eat all you can around @ RM9 for Durian Kampung only. But because the promotion started during lunch time around 1pm, the durians were completely sold off when we reached there at 8pm. 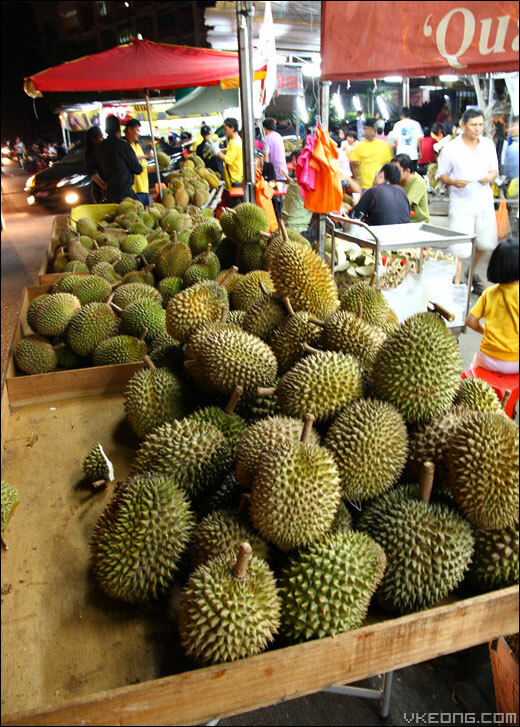 The only other promotion going on was RM15 for D24 durians. We didn’t take it and walked to the next stall, Donald’s Durian. Donald’s Durian was having the buffet for Durian Kampung @ RM10 and RM20 for D24. 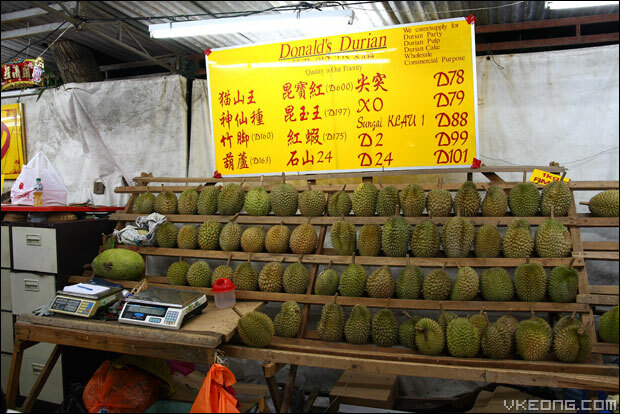 It’s slightly more expensive than DurianSS2 but it was also the most crowded one. Some of the varieties of durian they had at Donald’s Durian. I like the fact that they cater for durian party. I hope it’s not the throwing type one lol. Since it’s a durian buffet you don’t get to choose the durians yourself. So there are bound to be hits and misses. The workers just bring the durians to your table whether you like it or not. You might have a better chance of getting the nicer ones if your PR skill worked on them, else it’s all about your luck. 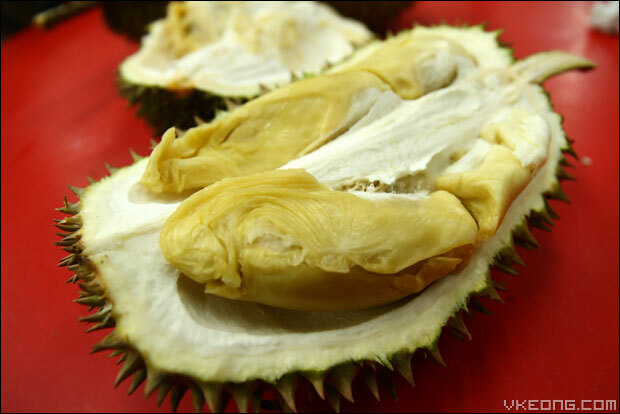 Luckily the first durian that arrived on our table was also the biggest and also the nicest we had that night. If lady luck is not on your side, you would get small and hard durians like this. 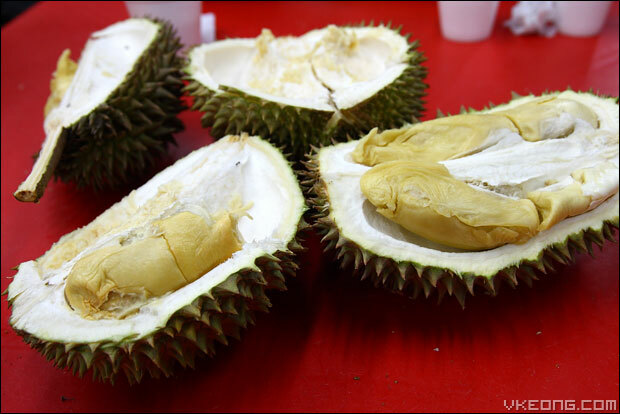 After getting 2 durians we were not satisfied with – one being watery and the other one with a weird numbing aftertaste, we decided to complain. The complaint worked and the bad durian was discarded into the bin by the worker. 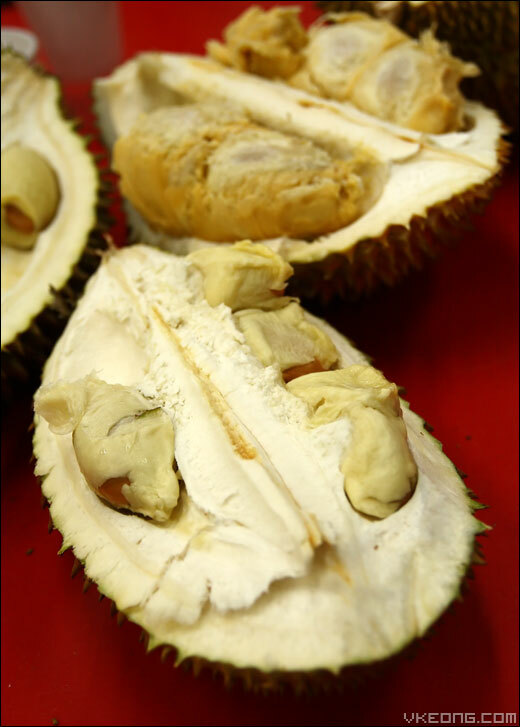 We were just glad we weren’t forced to finish the bad durians. And instead of asking the workers, we asked the lady boss to choose the durians for us. 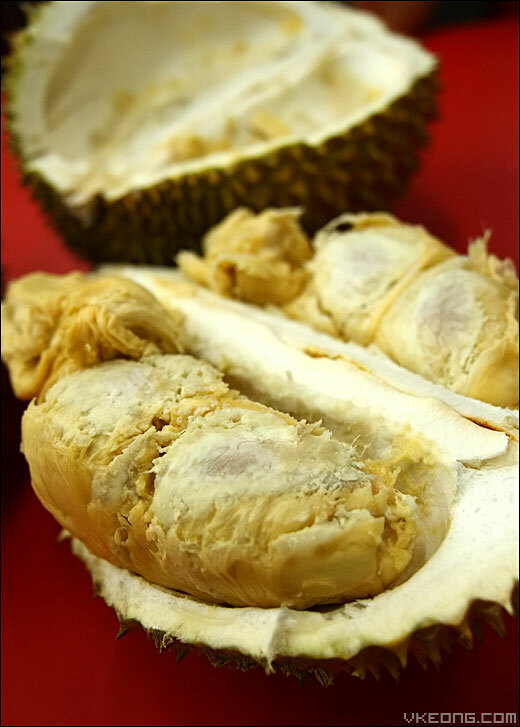 That proved to the best thing to do, as she delivered two nice tasting durians. Besides, she’s much more friendlier too. In total we had five durians (2 big, 2 medium and 1 small sized) shared among the four of us. If you ask me whether RM10 is worth the try.. I would say yes. But I highly doubt I would return for it again, at least not within the same year. I have far exceeded my quota of durians for this year in one night alone lol. 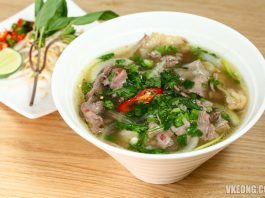 I am hoping I won’t get sore throat the next day. 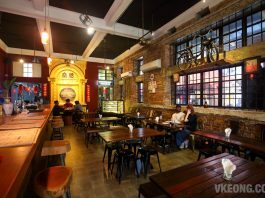 For a first timer, I was wondering if there was any basin to wash our hands, and whether drinks were served. Much to my delight, there was a basin and purified water is available for free. The basin was interesting because it had one of its taps fixated with a durian shell. It is said that the water flowing through the inner part of the shell would help to eliminate the durian smell from your hand and mouth (if you gargle with it) I didn’t try it because it seemed weird lol. Have you tried it before? Does it really work? One of the pioneer food bloggers in Malaysia since 2006. Interested to work with me? Drop me an email.